The Mount Holyoke Klezmer Band on stage at the Five College Jazz Festival last Friday. 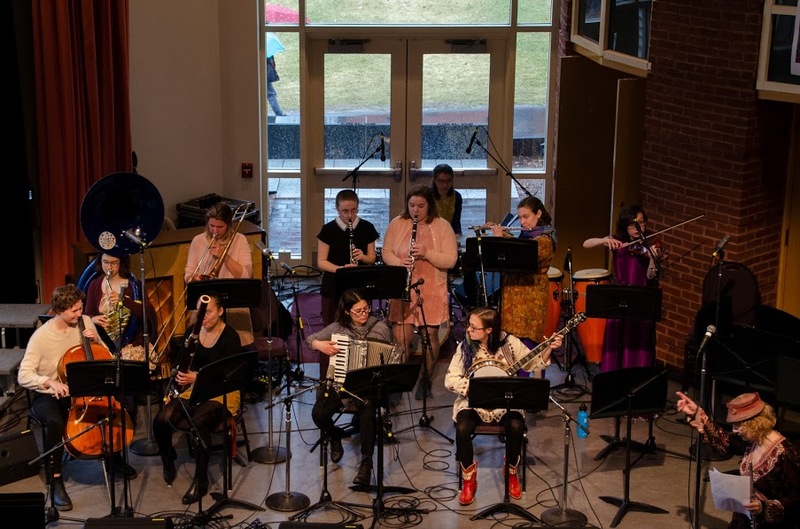 The Mount Holyoke Klezmer Band warmed up the crowd with traditional upbeat folk songs. Director Adrianne Greenbaum took audience members by the hand to dance to the beat of the lively music. Next, two Amherst Jazz combo groups brought traditional jazz instruments to the stage, including the trumpet, upright bass, trombone, saxophone, piano, flute and drums, as well as successfully incorporating less traditional instruments like the electric viola. The two groups, “Impressions” and “Ascensions,” breathed new life into the timeless classics audiences might have expected — like Duke Ellington’s “Mood Indigo” — while also experimenting with new hits (including a jazzy rendition of Kanye West’s “Ultralight Beam” that had toes tapping and heads bobbing). The sizable UMass Vocal Jazz Ensemble wowed with astonishing individual talent and group harmonies, accompanied by an adept percussion section. UMass senior Charles Vadala explained that the group had been rehearsing for the Five College Jazz Festival for much of the semester and that as a pianist, he and the rest of the percussion session joined the singers to practice the accompaniment after they’d learned their vocal parts. Vadala added that “it’s easy to be a UMass college jazz student and forget about the jazz community in the rest of the Five Colleges.” Thus, the Five College Jazz Festival provided a means of celebrating and recognizing the work of musicians from other schools. The Mount Holyoke Vocal Jazz Ensemble presented favorites from their “Big Broadcast” performance, including the snappy, playful “Java Jive,” featuring soulful alto soloist Lexxey Boron-Smith ’20. Soloist Lily James ’21 also led the group through “Blues in the Night” with her clear soprano voice. The group’s lighthearted set incorporated mid-song whistling in “Blues in the Night” and replicating the sounds of coffee pouring in “Java Jive,” to the audience’s amusement. The Hampshire College Jazz Improvisations Orchestra then took the stage to give the audience a taste of improvisational jazz. Each student — with director Marty Ehrlich — had their own improvised solos in a bluesy set that pleasantly ambled through different musical phrases with vocal accompaniment. Other features throughout the day included the Mount Holyoke Chamber Jazz, Smith College Jazz and UMass Jazz Lab Ensembles. Rachel Bostick ’19 and Amelia Johnson ’20 came to the festival to see a friend perform but ended up staying for almost the entire day. The two enjoyed aspects of every band’s performance and wished there had been a designated space to dance along with the groups. The day concluded with a rousing performance from the Mount Holyoke Big Band joined by soloists from Mount Holyoke Vocal Jazz, drawing the day’s biggest crowds and ending the festival on a bold, brassy high note.